How can music improve the lives of people with dementia? Every couple of weeks I drive to Auckland to make music with my mother, Sue. It’s fun and joyful for both of us. My mother has dementia. It has been gradually progressing over the last five years – maybe longer than that. Early on, it affected her ability to remember words and communicate, as well as scrambling her memories and her ability to recognize people and to carry out basic everyday tasks. I imagine that for someone like my mother, who was a highly intellectual, fiercely independent person who relied on her brain to get her through life, losing control of her mind must have felt like the worst thing, the scariest thing that could possibly happen to her. There is so much fear, judgement and shame surrounding dementia. For three years Sue has lived at Shelly Beach Lodge, a small dementia unit in central Auckland. It’s a cheerful place, with wonderful and kind caregivers. Mum has a view of Rangitoto from her bedroom. But there are security locks on the doors and gates to prevent the residents from getting out, because they’d get lost easily. Visiting a loved one who has dementia can be stressful and sad. You sit there holding their hand, while they cry. You try to make cheerful conversation with a person who can’t respond. Or, you talk to the family member who has come with you, while your mother sits there, obviously feeling left out. Or (worst of all) you check your cellphone, while mum stares vacantly into space. So, when I discovered how much Sue enjoyed it when we made music together, a lightbulb went on for me. Modern medicine doesn’t know what causes dementia, and it can’t cure it, although there are some drugs that can slow the onset in some people. The UK-based charity Lost Chord, which offers music sessions for people in residential care homes, says: “Dementia is not a specific disease. It’s an overall term that describes a wide range of symptoms associated with a decline in memory or other thinking skills severe enough to reduce a person’s ability to perform everyday activities.” Alzheimer’s Disease is just one type of dementia, but it’s often used as a general term, possibly because people think it sounds better than “dementia”. Sue doesn’t have Alzheimer’s, according to her specialist medical diagnosis. My brother David, who is a GP, thinks that our mother’s dementia probably started off with a small stroke in the arteries of her brain. Sue coped for quite a long time without talking about it to me or anyone else. Actually, she has never for one minute admitted to my brothers and I (or anyone else I know) that there is anything wrong with her. This is an attitude that has served her well throughout her life. 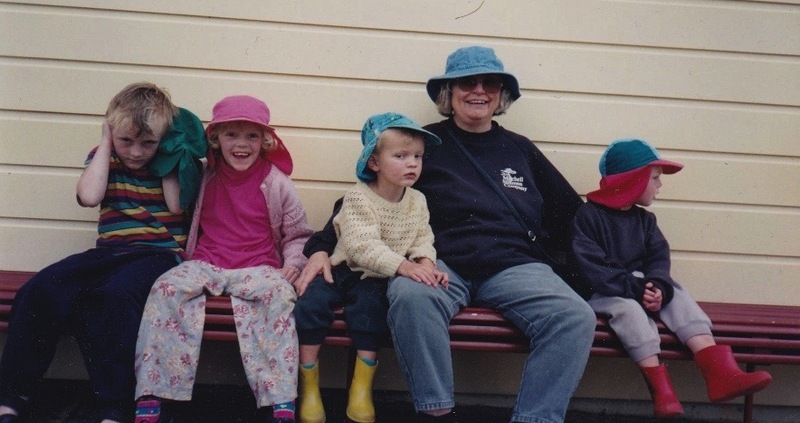 Sue is a colourful character who has lived a full and active life. 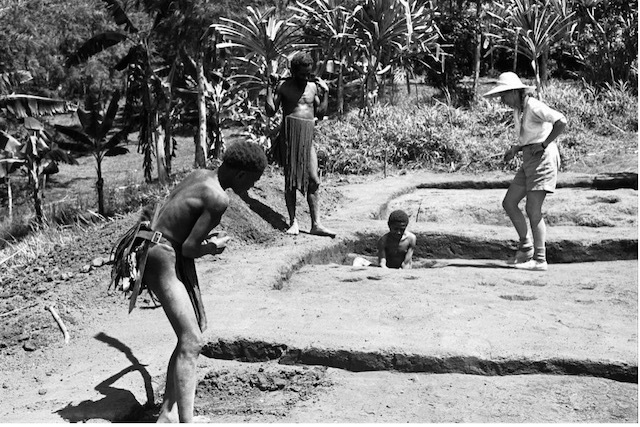 In the 1950s, before I was born, she was the first archaeologist to do research in the New Guinea highlands. Sue was also a musician – a guitarist and folk singer, just ahead of Bob Dylan. When I was six she taught me to play ukulele, and half a century later this is paying off big-time, for both of us. There’s been a lot of media excitement in the last couple of years about the possibilities of using music as a therapy for dementia. A growing body of clinical evidence suggests that making music is highly beneficial for people with dementia. With the lack of effective drugs or a cure for dementia, music is quite probably the most effective therapeutic approach. The 2014 documentary Alive Inside has some inspiring examples of the difference music can make in the lives of people with dementia. When I’m singing with Sue and the other residents at the dementia unit, we are all in the music together. Sue has fun, I have fun, and so does everyone else, including the staff. It’s the closest thing we’re going to get to a level playing field. My stepmother Lena, who has been on good terms with Sue for many years, usually comes to join in the singing. Lena, who was a nurse in an adolescent mental health unit before her retirement, has been an enthusiastic supporter of the music sessions. Her encouragement and energy have been incredibly helpful to me. 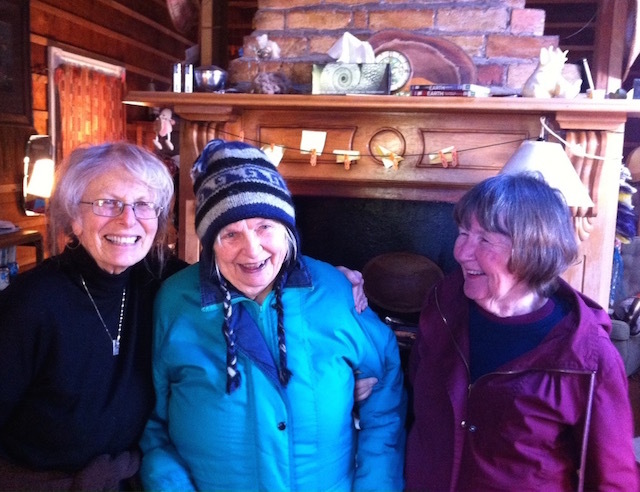 Sue (centre) with old friends: on left, Lois Webster, and on right, Lena Bulmer. I’m also now running similar music sessions at dementia units in my hometown, Hamilton. About a year ago I was invited to join an organization called Neurogenesis, which is a charitable trust offering participatory music to a wide range of special needs groups in the Waikato. A couple of the flagship programmes, which I’m involved with, are the “Alive Inside” participatory music sessions in dementia units (the name is inspired by the documentary), and “Sing Out”, a community “singing for health” group aimed at seniors. I’ve also been involved in music sessions run by our local Alzheimer’s Association. My colleague Dave Ward-Smith founded Neurogenesis out of his personal experience. Some years ago he recovered from a serious head injury with the help of music. The other musician involved in the Alive Inside sessions is Graham Horne, who brings a wealth of life experience as a musician, music teacher and from his work in psychiatric hospitals. There are always at least two and usually three of us running the music sessions. Graham brings his guitar; I play ukulele and sometimes fiddle. We take along a basket of shakers and other instruments, and sometimes a spare ukulele. The sessions are always a lively, joyful time, with residents getting up and dancing, requesting favourite songs and sometimes leading the singing when they know the words better than we do. Here are some of the tangible benefits of music for people with dementia. One of the most dramatic effects that music can have is that it can wake people up, out of the “dream state” of dementia. There’s a vivid example of this in the documentary Alive Inside, where a man called Henry, who is very withdrawn and unresponsive, is given an Ipod with some favourite old music on it. Suddenly he becomes awake and alert. I frequently see this happening, when I’m making music in dementia units. Often when we first arrive and start singing, many of the residents are slumbering in their chairs, oblivious to what is around them. Gradually, the music wakes them up, sometimes to a point where they are alert and actively participating in the singing. I’ve observed that people who have a severe level of dementia can often remember all the words to favourite old songs. This gives people a sense of competency, when in their everyday life there isn’t much of this. “Somewhere Over the Rainbow” is one that my mum remembers well – and so do several other people at Shelly Beach Lodge. “You Are My Sunshine” is another one that people with dementia often know better than I do! Mum and I always have fun singing together. The Alzheimer’s Foundation of America says that songs from a dementia sufferer’s young adult years – 18 to 25 – are most likely to get a positive response. My mother doesn’t recognise the music that I remember as being her favourite during my childhood – songs by Simon and Garfunkel, and Judy Collins. But she does remember and enjoy singing “Que Sera Sera” and “Wonderful World”. In a group singing session I offer a variety of songs from different eras, to make sure everyone is catered for. One of the other residents at mum’s dementia unit is a former singing teacher who, despite having dementia, can remember the words to all kinds of music, including some complicated Beatles songs. Everyone enjoys singing “Hey Jude” and joining in on the refrain, even if they don’t know all the words. The recent US study co-authored by Linda Maguire and Jane Flinn found that group singing improves the cognitive abilities of moderate to severe dementia sufferers. The research compared two groups – one who sang popular songs, and one group who just listened to the music. The difference was substantial. Singing doesn’t always make my mother happy – sometimes it makes her cry. Music can bring up uncomfortable emotions. Sadness, grief, anger and frustration are part of dementia. The first few times this happened with mum, I was taken aback, but now I know that it’s not a permanent state. I keep on singing, and the sadness usually passes into something else with the next song, or the one after that. Through music emotions can be felt, transformed and released. And then there’s the sheer fun of making music. 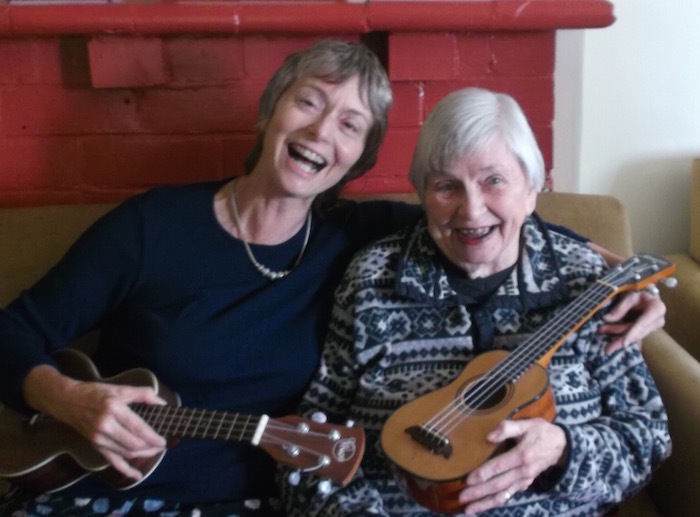 Making music offers a great opportunity to have fun – not just for people in dementia units, but for just about everyone. Also, group musical participation is one of the best ways to help people feel connected to others. Spending time with a loved one who has dementia is often sad and unrewarding, especially if they can’t communicate. Making music together is a wonderful opportunity for everyone to feel connected and have fun. Out of Sue’s dementia has come this blessing of shared music, which I appreciate even more because it has come through the pain and hardship. Fish oil: how can you tell if it’s good?